Thanks Tom! !still wish for a German win! !go go!! But again, the German back line was pushed too far up, acres of space behind them and it only took one ball to release the French. They've got to be sharper if they're going to push up like that. that was an Ochoa-like save. @Iain, I don't deny that at all! Neuer was a the difference maker in the German team in that game. Dunno why their line was so high but obviously they had less respect for Algeria than they do France! What a save by him there btw! Iain, in all fairness, France have looked great so far. With that said, they haven't faced a top class opponent yet. Better touch there and Valbuena has a much better angle. Of course Hummels would be the one to block Benzema. Wow! Have to say- Valbuena/Griezman/Benzema combine tremendously well together! France can't make the resulting corners count... but they're looking much better now as Paul Pogba steals the ball and launches a counter, but they waste it on the left. Another half-chance for Germany as Raphael Varane deflects a pass through to Miroslav Klose, but a clearance is smacked straight into Sami Khedira's face. Khedira takes a ball in the face. Not sure he needs a stretcher for that. France in a trance. Need to wake up! Desperation in the French penalty area! what do you say about ozil's performance so far?? Cabaye is indeed walking a fine line, and should have been carded for dragging back Muller. The next one will be a definite yellow for him. 39" - Neuer sighting! 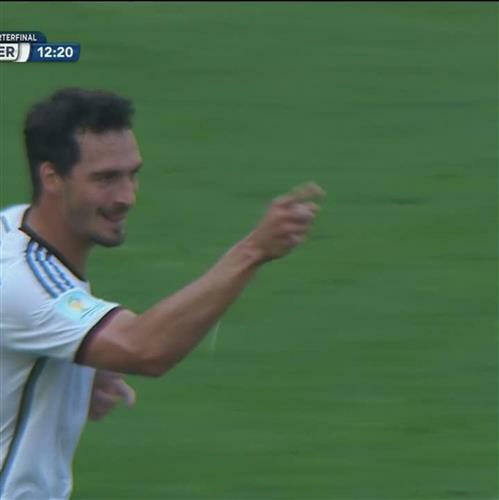 He almost comes out, but plays it safe and Germany retain possession. Ali, quiet but inoffensive game for Ozil so far. 81% passing, but the inaccurate ones are in the final or middle third and usually forwards, so at least he's having a go. Oh yes. I've got stats. Free kick out on the left again for Germany now... but France clear. They really have to be careful on those set pieces. Well no one can accuse Debuchy of lacking commitment! He is throwing himself everywhere. Good lord, there are only five minutes until the break. This half has flown by! ooh, Karim Benzema wants a handball in the Germany area after his header strikes Mats Hummels... but it hit the German's chest. Another chance goes begging. Benzema with a clear header, but Hummels valiantly hrows his torso in front of it. More stomach than chest, really.